Have you ever been in the position of checking in to that dreamy hotel you had booked months in advance, arriving and setting up shop only to find you never wanted to leave the confines of the hotel itself? Shangri-La Hotel, Paris, as we fortunately discovered, epitomises everything you would like to find in a hotel… and more. 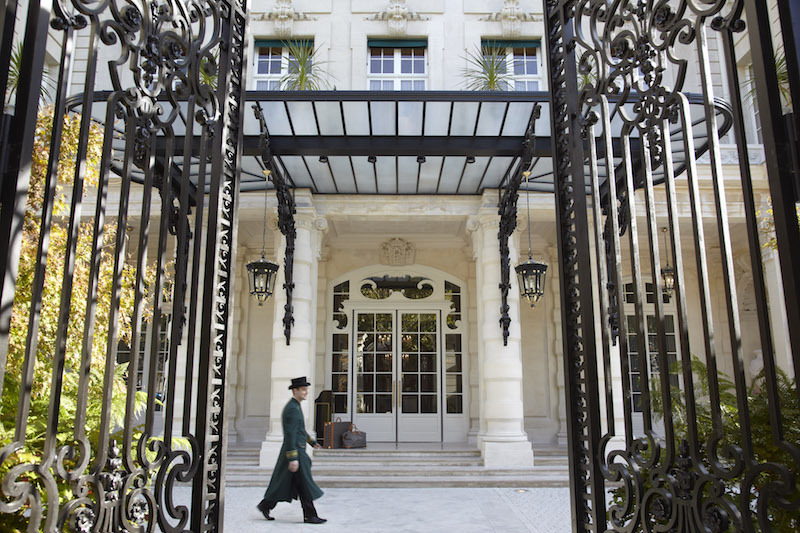 As we took a step into the historical palace, now hotel – once also the residence of Napoleon Bonaparte’s great nephew, Prince Roland – you are immediately transformed into a time gone by. With character, elegance and history engrained in the four walls surrounding your every step, Shangri-La Hotel represents everything that Paris is renowned for. Taking over 105,000 hours of labor to build, putting up the walls of Shangri-La Hotel was not an easy feat. With 100 rooms and suites, the hotel itself is somewhat a maze. As aforementioned, Shangri-La was once the residence of Prince Roland Bonaparte. A learned Aristocrat, avid traveller, and cultured gentleman, Bonaparte would often use his home to host marvellous parties for friends, family and guests. With a fascination for the Eastern and Western world, he would make voyages to Indonesia, India and remote Mongolian regions such as northern China and Tibet, which evidently inspired some of the characteristics of Shangri-La hotel in Paris, today. Stepping into Shangri-La after a long, 26 hour flight almost seemed like a dream. Immediately you are enticed by the hotel’s decor. To your left, the grand staircase; spectacular in all its glory. To your right, the beautiful lobby “waiting rooms”, formerly Bonaparte’s cigar, cocktail and entertaining rooms. As one of the lovely staff members welcome you to your beautiful and bright room, you will immediately be drawn to the priceless view; the Eiffel Tower. Ingrained in your memory forever, it is little wonder as to why Shangri-La Hotel, Paris is one of the most renowned hotels in Europe, if not, the world. A pot of traditional Shangri-La Tea will be waiting for you in your room; a favourite of the Emperor since the Song’s dynasty. From the province of Fujian, the Jasmine Chung Hao is considered to be one of the best Jasmine teas of China and the world. A great welcoming gift for you and your partner to enjoy. Rooms are elegantly grand and certainly luxurious. With classic French style and elegant tones of blue, gold and cream, each room preserves the charm of a high-class private Parisian residence. At your beck and call, whether it be room service, a dinner reservation, laundry or anything in between, the friendly and amicable staff at Shangri-La attend to any need you may have. Impeccably trained and extremely courteous, we felt right at home as soon as we were welcomed by the steps of the hotel’s entrance. Genuinely concerned about each guest, the staff at Shangri-La make it their first priority that all guests are comfortable and enjoying their stay. Shangri-La Hotel offers an array choice of culinary experiences where diversity and quality come together to satisfy the most discerning of palates. Fortunate enough to dine at ‘Shang Palace’; the only Chinese restaurant in France to be awarded a Michelin-star, and home to authentic Cantonese cuisine that even the fussiest of eaters would not have a problem consuming. Head chef Samuel Lee Sum and his brigade of four Hong Kong chefs assure Shang Palace’s authentic culinary style. We sat in one Saturday evening to experience the art of Cantonese fine dining. Our dishes were picked by the head chef, and included the likes of sliced pork and cucumber rolls with garlic and chilli oil, fried eggplant glazed with gravy, sesame and ginger, crispy pork brisket, deep-fried Madagascar prawns with crispy garlic and chilli, Kung Pao chicken; even the marinated foie gras and bean curd in Chaozhou style was a shear delight. Dining at Shang Palace, you are treated to authentic Chinese food inspired by the cuisine of two regions in South East China (Canton and Huaiyang). “Cantonese cuisine takes its rhythm from the seasons, with the deepest respect for nature,” head chef Samuel Lee Sum said. Shang Palace means “aromatic scent” and “place for royalty”, and it is these two factors, intertwined, that are totally present when dining. After a meal at Shang Palace, we treated ourselves to a cocktail (or two) at ‘Le Bar Botaniste’. Honouring the favourite pastime of the hotel’s original resident, Prince Roland Bonaparte, Le Bar Botaniste celebrates botany through rare botanical spirits. With an extensive menu of exclusive cocktail creations and carefully selected liquors, there’s something for everybody to enjoy. Le Bar Botaniste is the kind of place you would expect Dean Martin, Frank Sinatra and Sammy Davis Jr to frequent at; marvellous and grand in all aspects, with quality cocktails to match. Entertained with subtle Jazz whilst reading the menu over a flickering candle light, the mood was set. We tried the ‘La Vie en Rose’, an ode to Edith Piaf, which was concocted with Gin Hendrick’s, liqueur St Germain, eau de rose, and airelles; simply delicious! 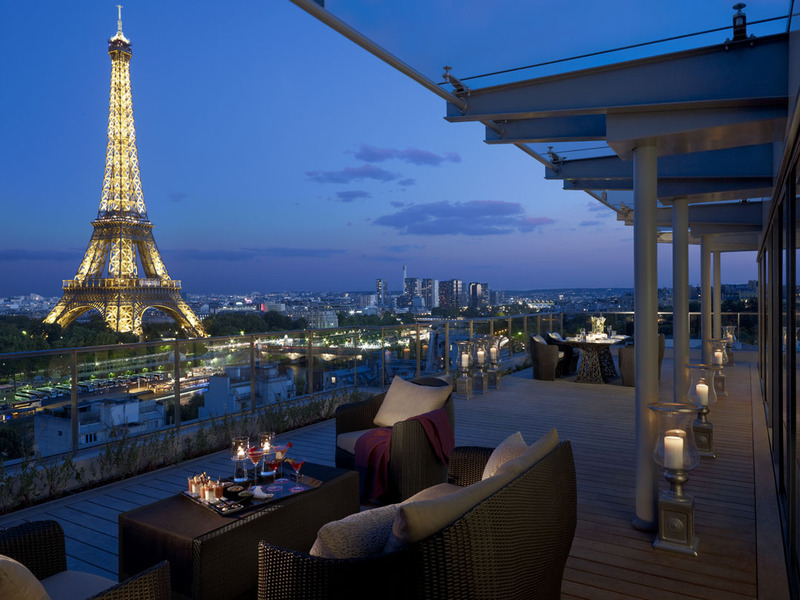 In extraordinary fashion (as to be expected), Shangri-La Hotel offers sweeping views of Paris, and in particular, a little historical monument the French like to call ‘La tour Eiffel’. With several suites offering views of The Iron Lady, you simply cannot go past ‘La Suite Shangri-La’, the hotel’s premier suite. With a total of 225 square metres of living space, and a panoramic view over the city, the Shangri-La suite doesn’t come cheap; 20,000 euro per night, or a whopping $30,000 Australian dollars. 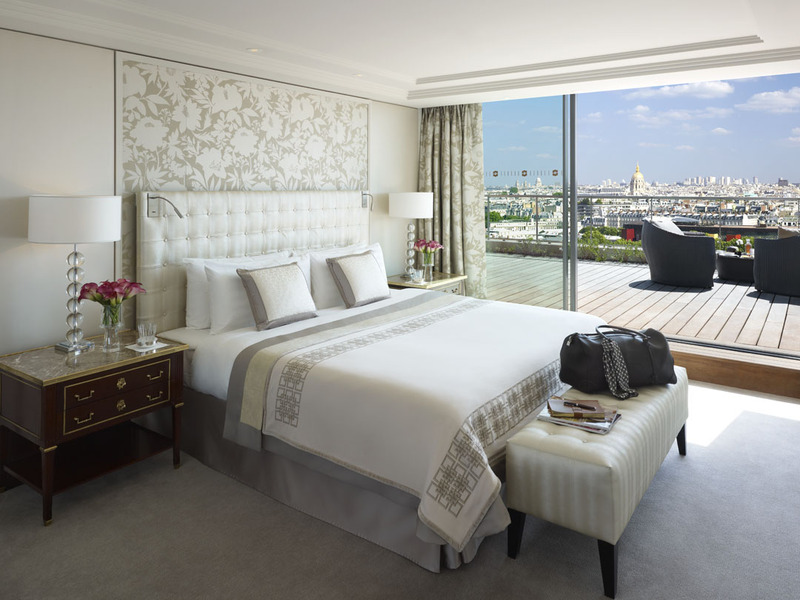 However, if you’re in the know, a booking at ‘La Suite Chaillot’ in the summer will see you welcomed to a private room on the fifth floor, where you can sit back on the terrace, with a glass of Champagne in hand, watching the Tower sparkle in all its glory. It is these very views, along with the Palais Iéna’s historical significance, that make Shangri-La Hotel, Paris one of the city’s most extraordinary luxury hotels; and definitely the hotel worth staying in for.